Hello everyone! 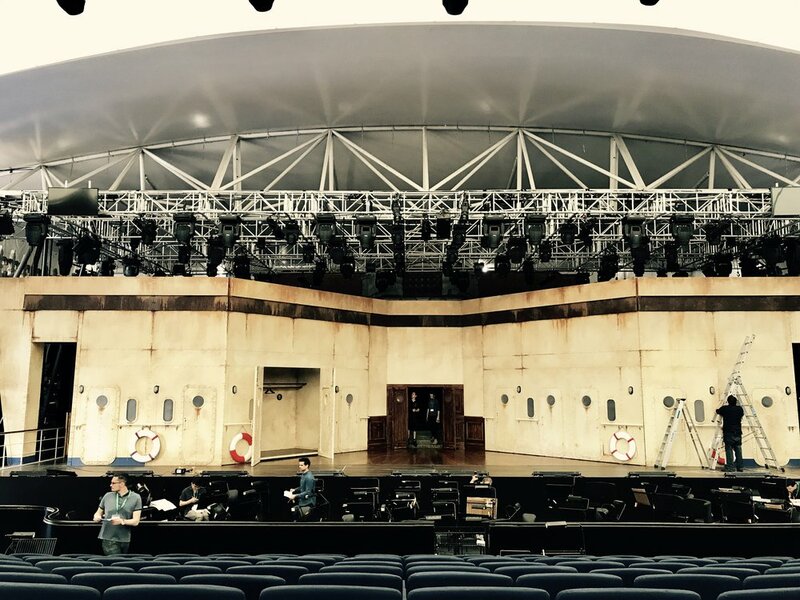 I've been on radio silence with blogging because we've been incredibly busy at Opera Holland Park putting together what promises to be a fantastic Young Artist show of Don Giovanni. We're now in the final week of rehearsals and, as such, I've got a bit more availability to talk a little bit about the process this far and also to share with you some fascinating trivia about this opera that I discovered while I was researching and preparing the role. First of all, I'm so incredibly grateful to Opera Holland Park to give me the opportunity to have my serious London debut. After 7 years in this city working so hard and perfecting my craft, it's great to receive this recognition and to have the chance to perform in one of London's most popular stages. It's an incredible team to work for and I really couldn't have asked for better colleagues. I feel incredibly fortunate to be working with a cast that generates such an amazing energy and working environment like this one. Every single one of my colleagues is absolutely incredible at what they do and what a joy it is to just sit back in rehearsals and watch them do their thing. The entire process of musical and dramatic creation has also been fantastic. We've been very fortunate to have our wonderful conductor Harry Ogg in the room with us since the beginning and both he and our director Roxana Haines have been helping us craft a show where the characters go way beyond the Commedia dell'Arte models which they're inspired upon. We're approaching the music and drama from a very human point of view. It could be argued that it downplays the humour, but if we think about it, is Don Giovanni really a comedy with all its murder and at least two attempted rapes? It's incredible to play this opera - and Masetto in particular - in a way that focuses on the impact that Don Giovanni's actions have in those whose lives he inevitably changes (usually for the worst). The stakes are always very high for every single character and this is indeed a Villain who really deserves the end he gets. Being a Young Artist, I'm also covering the shows of the main cast and it's been very interesting to sit in their rehearsals and watch them work and watch how a different team has sometimes completely different approach to the same characters in the same production. Another bit of incredible news is that our Young Artist performance on June 22nd is now sold out! How exciting that is! I would advise you to be in touch with the Box Office for returns in case you want to come, and if you do, please do pop by backstage to say 'hello'!. Moving on to some facts about Don Giovanni, if we think about the context of Opera in the 18th Century, the emotional content portrayed in this work is something new. Abject terror was the emotion intended. The Overture to Don Giovanni gives us a brief opportunity of what it will be like to experience the opera. The piece opens in D minor, which later in the opera represents the "punishment key for murder." The show premiered in Prague prior to its opening in Vienna, and it was not well received. It was likely that the orchestra had to sight read parts of the score at the opening performance because of Mozart's delay in notating it. In further analysing the opera and its libretto, interesting things can be revealed. Firstly, the original version of the libretto was filled with misspellings on Da Ponte's part; even the spelling of Mozart was incorrect! The entire second half of the first act was omitted in this version, which is speculated to be so as to appease censors, as Don Giovanni cries out "Viva la liberta!" in one scene during that segment to which Da Ponte feared the reaction of officials. The Viennese felt that Mozart's operas may have lacked the grandness of Italian opera and he may have been viewed as an outsider, but Mozart gained something politically positive with the Viennese premiere of this opera: in Act I, Don Giovanni shouts "viva la liberta" (long live liberty) and in the opera, the enthusiastic outburst is puzzling, while everyone on stage seizes the moment and shouts "viva la liberta" a triumphal march is played. Many scholars have debated the logical purpose of the outcry. As a character, Don Giovanni is simply the personification of Appetite, Lust and Violence in the terms of the Baroque society and is perceived in the last part of the 18th Century, the age of Enlightenment, as a threat to the institutions of a stable societal hierarchy. However, the reason why Don Giovanni didn't face any troubles with Viennese censors of the time is that when it premiered there, many of Emperor Joseph's counter-reforms were already in place (lightening of the oppressive censorship with which his mother ruled) and, in a sense, like Nozze which showed that nobility wasn't all powerful, Don Giovanni also shows us that degenerate aristocracy will be dragged to hell if it doesn't behave properly. This served the Emperor's purpose of affirmation of his power. It has also been realized that puns were made in the libretto based on the names of the original people contributing to the show. The harpsichord player, Jan Kritel Kuchar, was worked into the opera; Kuchar means "cook" in Czech, and the supper scene in the opera features the repeated phrase "si eccellente è il vostro cuoco," meaning "excellent he is your cook." Additionally, the original Donna Anna was played by Teresa Saporiti, and at one point in the opera Don Giovanni cries, "Ah che piatto saporito, saporito, saporito!" This means, literally, "What a tasty dish!" Such soprano roles, at that time, were performed by castrati as women in Rome were not permitted on the stage. This was true for not only roles like that of Donna Anna but also of Zerlina, who was portrayed for the first time by Goldoni's wife, Caterina; she had played the Susanna in Mozart's Le Nozze di Figaro already.